Historically, the role occlusion plays in TMD has proven controversial and inconclusive. Some studies demonstrate an association between TMD and occlusion (Pullinger et al., J Prosthet Dent 59:363, 1988), and others find no connection (Dworkin et al., J Am Dent Assoc 120:273, 1990). Given this lack of consensus and clear causal relationship between occlusion and TMD, the idea of treating TMD by making modifications to the occlusion seems unmerited. 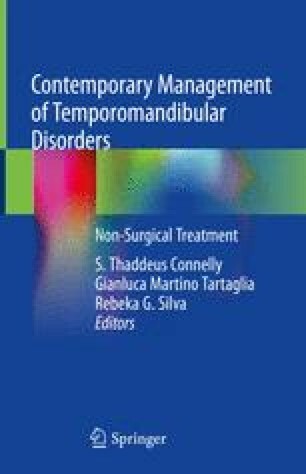 On the other hand, as a major component of the stomatognathic complex, the occlusion is of course an important consideration when formulating a diagnosis and treatment plan for the TMD patient. Specifically, it is critical to develop a stable and reproducible occlusion to achieve a stable result of various surgical and nonsurgical manipulations aimed at directly treating the TMD. Additionally, as discussed below, the goals of obtaining a mutually protected occlusion and minimizing the centric relation/centric occlusal variance may very well, either directly or indirectly, contribute to a decrease in TMD symptoms and improvement in function. Regardless, the reality is that the restorative dentist will be called to provide dental care for the TMD patient and this necessitates that the clinician possesses an understanding of TMD and the dental considerations involved. Thus, the purpose of this chapter is to demonstrate a conservative diagnostic and treatment protocol that can be used as a guideline to provide appropriate dental care to the TMD patient.